Everyone is welcome in the Tom Keneally Centre. 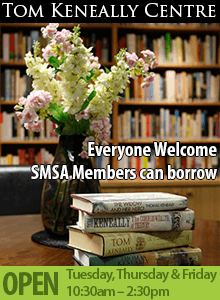 You do not need to be an SMSA member to BROWSE the Tom Keneally Centre collection. However, to BORROW from the Tom Keneally Centre collection, you must be a current SMSA member, either full or concession. Multiple subscriptions are not valid in the SMSA Tom Keneally Centre (i.e. the maximum number of books borrowable is 2 regardless of the number of library subscriptions paid for by the member). Readers and WEA members are NOT eligible to borrow from the Tom Keneally Centre as their borrowing rights extend to the main SMSA Library only. TK First Editions and the TK Special Collections are not available for loan. A maximum number of two (2) books may be borrowed from the Tom Keneally Centre at any one time for a period of two (2) weeks. SMSA Tom Keneally Centre books may be renewed once. Members may place a hold/reservation on books that are currently out on loan. The item will be held a maximum of two weeks. Where possible, please assist us by returning items borrowed from the Tom Keneally Centre directly to the SMSA Tom Keneally Centre, rather than to the main SMSA library on level 2. Members can borrow up to two (2) TKC books for a two (2) week period, in addition to their normal SMSA borrowing quota.